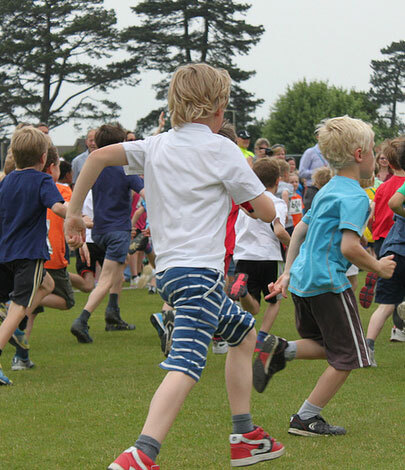 The Tring Midsummer Fun Run will take place on Wednesday 19th June 2019. The event begins at 5pm at Tring Park Cricket Club. *Pre-school run – There is no lower age limit for entry in the pre-school run, but we suggest that under 4s are accompanied on the run by an adult (the accompanying adult does not need a number). No results will be published for the pre-school run and there will be no winner’s trophy, as the objective is simply to let younger children join in the fun. All children taking part will receive a medal. If you have entered in advance, please go to the Number Collection desk on the day to pick up your numbers. The desk will be open from 2pm onwards, so you can either pop in during the afternoon if you are local, or you can collect your numbers when you arrive for the runs. If you have not entered in advance, you can still enter on the day (see above for the on the day entry fees). The Entries desk will be open from 2pm onwards, so you can either pop in during the afternoon if you are local, or you can enter when you arrive for the runs. However, please be aware that the entry desk becomes very busy between 5 and 7pm, so please allow sufficient time to queue. We are only able to accept cash or cheques on the day. Please wear your number on your FRONT, as we need to be able to see it as you cross the line. Use 4 safety pins, one in each corner, as otherwise the number may fold over and not be visible. There will be plenty of safety pins available at the number collection and entry desks. There is no parking at the cricket club and limited parking on the cricket field from Station Road. Please avoid bringing your car or share if possible. Parking is available in the public car parks on Tring High Street. Refreshments and bar at the Cricket Pavilion plus burgers, hot dogs and ice cream. Please run in single file beside the canal and show courtesy towards other users of the tow path. In the unlikely event that someone falls in, please get a message to a marshal as quickly as possible. As it is important that runners are fully aware of others around them and are able to hear the marshals at all times, particularly at the road crossings, we ask that you do not wear headphones. Most entrants complete the 6km Tring Midsummer Fun Run in 50 minutes or less. This is a running event and we would encourage you to run at least part of the route. Brisk walking is also allowed, but please note that we will stop recording times after 60 minutes. Dogs are NOT allowed on any of the runs. Teams can be of any size, but the trophy will be awarded to the first team with three members across the line. To be included in the Team Challenge, simply enter the adult run as normal and add a team name. All team members must be 18 or over. We have not included a sponsorship form with the race entry, but have instead included the option to add a donation to your entry fee. All profits and donations from this event go to our chosen charities. If a child misses their race, they are welcome to run in a later race. They will still receive a medal, but will not appear in the results and will not be eiligible for their year group trophy. The same applies to children who opt to run in a longer race than the one that they are entered for. Parents/guardians/carers are responsible for their own children on the day. Dogs are NOT allowed on any of the runs. For adult runners of all abilities, including beginners. A free weekly 5k in Tring Park.